The way the rich and powerful hide their ill-gotten gains is headline news around the world today. The Panama Papers show everyone how easy it is to set up secret companies that let people avoid taxes and launder money. Kings do it, business tycoons do it, footballers do it, presidents and prime ministers do it. One hundred and forty politicians and public officials, including 12 current and former world leaders, are found to have used more than 214,000 offshore entities to hide the ownership of assets. 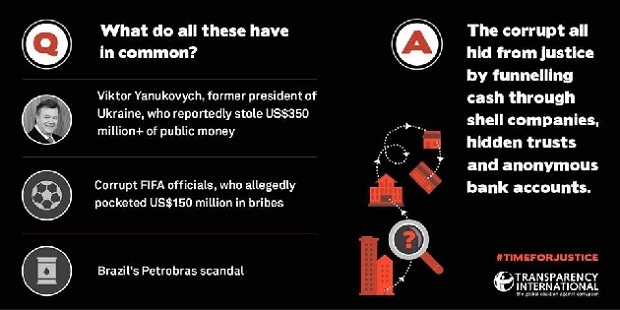 In a 2011 study, the World Bank found that 70 per cent of grand corruption cases involved companies camouflaging the identities of corrupt politicians. Millions of dollars in illicit money was disappearing behind corporate smokescreens and no one could find out who it was stealing it. But we believe there are many more people who want to stop this from happening. That’s why Transparency International is joining forces with Open Corporates, Global Witness, the ONE Campaign, the Web Foundation, Open Contracting Partnership and the B Team to help find a solution to the problem. We want to establish a global public beneficial ownership register that will help end anonymous companies, and the corruption and criminal activity enabled by them. The goal is to list the real owners of every company in every country. This new global register will combine public beneficial ownership data from governments who already have or will have public registries, and also provide a platform for companies to self-disclose this crucial information. Ultimately, this kind of disclosure should be mandatory. Make it easier for companies to know who they are doing business with, reducing risk, and making it safer and easier to do business with new clients and suppliers. Provide society with a better visibility of the activities of companies – from lobbying to public procurement licences to regulatory breaches. Remove the technical barriers for collecting beneficial ownership information. By acting as the beneficial ownership register in the ‘cloud’, usable by government bodies of all types, and from all jurisdictions it will reduce the burden on companies submitting information multiple times. This idea is not before its time. Despite promises made at G8 and G20 level to do something about beneficial ownership, Transparency International’s research at the end of last year found that 15 of the G20 countries have limited legal frameworks in place to deliver. Two G20 countries do not even have a legal definition of beneficial ownership. While it’s still early days, we’ve created a group of companies and organisations that are defining key goals and milestones and working on an implementation plan for this global public beneficial ownership register. The United Kingdom, Ukraine, Norway and the Netherlands have decided not only to require companies to report and update the information on who is really in control of companies incorporated in those jurisdictions but also to publish that information in a public register. Transparency International applauds these countries’ major steps in accountability. We believe citizens, investors, law enforcement, journalists and other companies have a “legitimate interest” in knowing this information. European Union countries are currently debating this issue of “legitimate interest” and whether the latest EU Anti-Money Laundering Directive should be public or not. Corruption is global and doesn’t respect boundaries. The easier corrupt money can enter and exit secrecy jurisdictions, the harder it is for law enforcement to follow its trail back to the corrupt. Even with public registries established in a handful of countries, only partial light can be shed on a small slice of the problem. Therefore, the world’s accountability rests on mapping financial data released by different jurisdictions against other data points in other countries. It is only with a global public beneficial ownership register that can we map the flows and find the ultimate source of the funds.